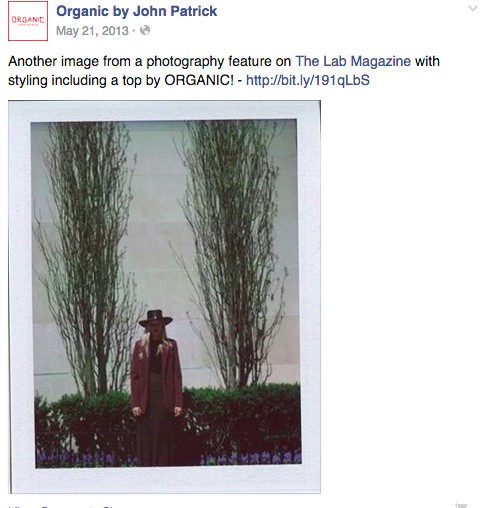 Organic by John Patrick is an established fashion brand that has a deep commitment to ethical practices and forward-thinking production and design. I worked as both a personal/office assistant and acted as the director of communications in 2013 and again in 2015, prior to relocating to the west coast. During my time working for the founders of the brand, I assisted with creating social media content, blog writing, digital consulting, line sheet design, email newsletter writing, press archival, various administrative tasks, shipping & receiving, writing a company biography and a statement for the Resort 2013 collection, as well as wrote and delivered a speech as a representative of the company at the Fashion Law Institute at Fordham Law on April 19th, 2012 for the 3rd Annual Fashion Law Institute Symposium, for the panel titled "Well Done! Eco-Chic, FTC Guidelines, and What It Means to Be Green," which was also reported on in Women's Wear Daily. Working hands on with the designers and the head of operations was one of my favorite work opportunities I've had to date -- an absolute pleasure. Assisting with editing, working alongside John Patrick for this article as published on Vogue.com. Example of social media writing. An example of blog content and social media work.